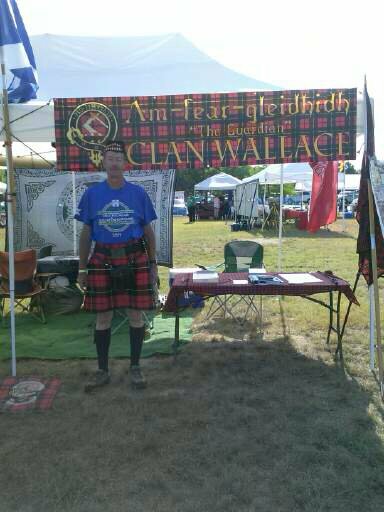 The Kerr County Celtic Festival & Highland Games, were held at Point Theater, Ingram, TX on August 15th & 16th, 2015, and Clan Wallace Society was there! 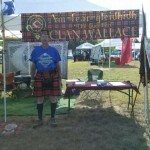 This was the first, and hopefully not the last, Kerr County Celtic Festival & Highland Games. Although the weather was hot, the humidity was relatively low with the Guadalupe River close by. Lynne and I participated in the opening parade and ceremony on Saturday. Numerous people dropped by to look at what we had on display and find their clan home areas on the Clan Map of Scotland that was posted at the tent. Several folks of Wallace affiliation stopped by and took membership information. No current CWS members stopped by. Various activities and sanctioned heavy athletics took place throughout the area. Saturday Night a ceilidh was held in the Gazebo lounge at Inn of the Hills Hotel in Kerrville. We provided a fifth of Glenfiddich 12 year old Single Malt scotch for the ceilidh. A good time was had by all at the ceilidh! Sunday was another hot day with low humidity. The various activities of Saturday continued on Sunday. A Barbershop Quartet, called Unfinished Business, wandered throughout the area and sang at several of the Clan tents. We plan to be there next year for their second annual festival next year. CWSW Past-Director Wayne Jones of WV has written a very interesting history of "The Wallace Well." The Scots bard Blind Harry first mentioned the Wallace Well (spring) in his epic poem. William Wallace was captured at a farmhouse just a few yards from the well 706 years ago, on August 5, 1305. The Clan Wallace Society was instrumental in getting The Wallace Well historic site restored. 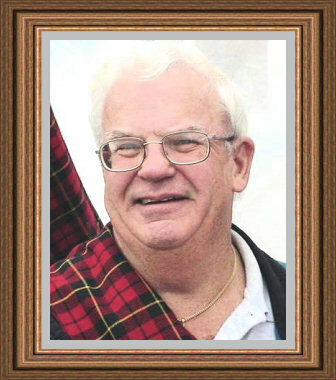 William Wayne Wallace departed this earth on July 29, 2011 in the presence of his loving wife. He was born February 15, 1939 in Belton, Texas. 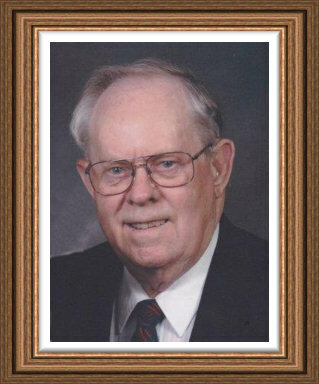 His birth was on the White Family Farm in Bell County.